Add yeast, sugar, salt & 1cup of Maida. Note: Warm water is used to activate yeast. Make sure that water is warm not hot. If it’s hot yeast will die. In another mixing bowl put rest of Maida. Add yeast mixture to make smooth dough. Add Maida or water if required to adjust consistency. The dough has to be soft. When the dough is ready add olive oil on top. Cover the bowl with cloth & ensure that cloth does not tough the dough. Rest the dough for 1 hr. After 1 hr the dough will be raised double the size. Remove the cloth, punch down & knead the dough again for 2min to remove air bubble. Now cover the cloth (no need to wet the cloth again) rest it for 45 min. After 45min cut the dough you need. Place it on the oven tray & spread it. Rest it for 5 min before adding toppings. Note: To make thin crisp pizza make holes from fork spoon. 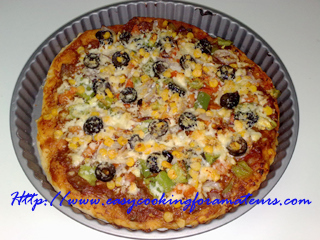 Mix tomato sauce & chilly sauce & spread on the pizza base. Spread pizza sauce on that. Now add topping onion, tomato, corn, olive evenly. Add rest of the cheese. Preheat the oven 250C for 10min. 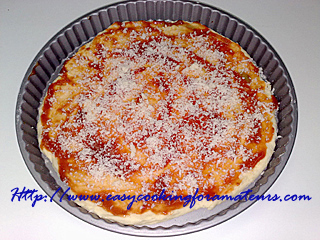 Bake pizza for 15min or till it turns nice brown colour. 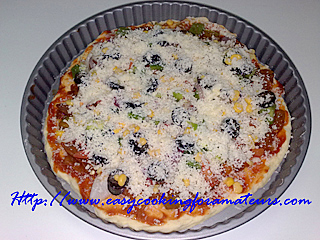 As we are baking pizza on tray instead of pizza stone the bottom will not be baked properly so after removing from oven place on griddle plate(tava) bake for 5min on that or till the base turns brown. Cut the pizza in to pieces. 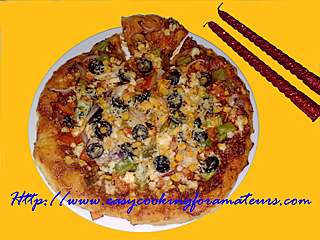 Serve it hot & Enjoy home made pizza. 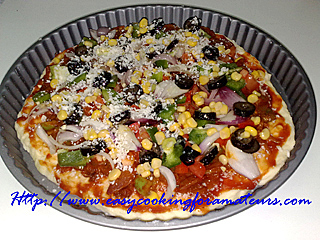 Note: You can add any topping it like paneer, mushroom, chicken nuggets,any leftover chicken and any vegetables you like.